A few weeks ago I wrote about a 7" on Snuffy Smiles by a band called Sanhose. I'd never heard of them before, but discovered that in addition to the 7", they had a full length out as well. It was surprisingly easy to find as it was put out by Recess in Japan. The US Recess website also stocked a copy. Now, it's always a bummer having to buy a CD instead of vinyl, but I will say that when you listen to a lot of Japanese punk rockers, you get used to it. Almost all full lengths seem to come out on CD with only a few exceptions on vinyl. 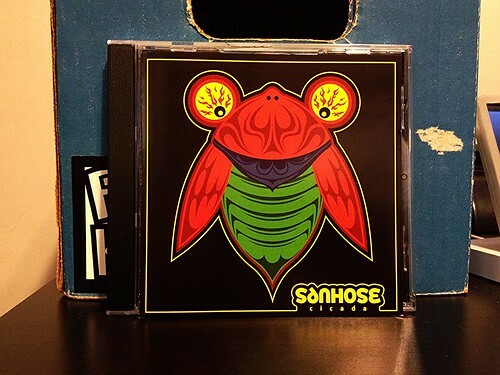 Now, I will say I was probably a little disappointed in this album by Sanhose. It's not quite as good as the 7". But that 7" was nearly flawless, so I imagine it would be tough to live up to it. Also the band had about another 5 years of getting better between these releases, so I do get it. That's also not to say this is a bad record, it's pretty good overall and has a handful of moments that really shine. Like the 7", the bulk of the songs on here are fast melodic punk rock that could fit in on Snuffy Smiles. The band really excels when they keep things poppier and take the tempo down just a bit, as they do on songs like "Pigeons" and "Your Stars." To me, the band is less successful when it's got the pedal to the floor, playing at breakneck speed and just shouting along the vocals. On Cicada, you can see the foundation of what is becoming a great band. Since I already know how good Sanhose got by the time they released the Parada 7", I'm really eager to see where they go next.